I’ve been working on Red Velvet Cake and attempting to find out if, and where, the red color originally came from. In my research I also found that Devil’s Food Cake was named because of the red color that came from the cocoa powder. So, I set out to find this red cocoa. I found out that the cocoa powder turns red as a part of the alkalizing process. Alkalizing also reduces the bitterness of the chocolate. 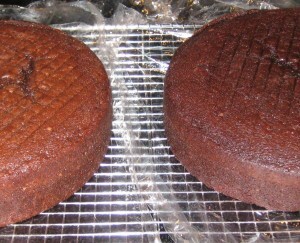 In this photo the cake on the right is made with a Garnet cocoa powder. My test run was using a Devil’s Food recipe Chocolate Devil’s Food Cupcakes from Martin Howard on the Food Network. I made two recipes with the only variation being the cocoa powder. My original cocoa powder was the Dutch Process Cocoa from King Arthur Flour. My second Cocoa Powder came from Cargill. I contacted them in my research and they were kind enough to send me a one-pound sample. The cocoa powder comes from Gerkens’ Cacao. The cake on the left is from the Cargill. It’s harder to see the difference in the color in this photo which is each layer cut in half. It is made from a 22 – 24% Garnet cocoa that comes from The Netherlands. It’s color is described as strong red with a European bittersweet flavor in a high fat option. 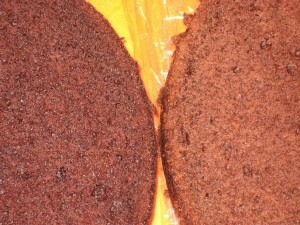 As you can see the cake is deeper in color than the Dutch Process Cocoa. The finished flavor was excellent. As I do more recipes and research with these cocoa powders I’ll write more articles. Cargill was kind enough to send me an information sheet about a variety of cocoa powders that I would like to try for different flavors. I would be thrilled if someone could actually send me verified information on the origins and history of the Red Velvet Cake. I feel like it wasn’t originally made with red food color and have read many myths on the internet.